College admission officers treasure applicants who challenge themselves and push their boundaries, both inside and outside the classroom. As students spend the academic year balancing course work, extracurriculars, athletics, test preparation, and (almost forgot) a social life, summer pre-college academic programs offer invaluable opportunities to take advanced courses, study topics not covered in most high schools. And with many application deadlines set in the winter or early spring, it's never too early to start planning your summer. Explore specialized subjects from archaeology to veterinary medicine, or learn a foreign language not offered by your school. Preview career options through pre-professional programs in fields such as business, engineering, and government. 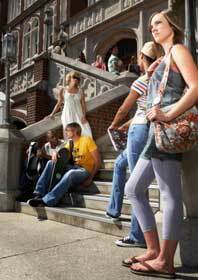 Programs held on college campuses provide prospective applicants with an in-depth look at academic and student life. Although attending a summer program is no guarantee of future admission to an undergraduate program, spending a week or more living in dormitories and meeting students and professors will help you better articulate your reasons for applying. School guidance counselors and independent educational consultants can advise students on summer program options, but you should begin your search by discussing your plans with your family and establishing a budget and time frame. Programs range from a few days to eight weeks or more, with tuition ranging from free to several thousand dollars. Day-only programs within commuting distance of your home may be an option and tend to be less expensive than residential programs. But if you're willing to travel to other states (or even other countries), including residential programs in your search will greatly expand the range of available opportunities. Academic programs are conducted by boarding schools, major research universities, smaller two- and four-year colleges, and private companies. Boarding schools offer a preview of dormitory living on small campuses, and course material may focus on advanced topics or reinforcing basic skills. Colleges and university programs offer a more social freedom and less structured course work; programs participants are treated like college students and often enroll in introductory-level classes alongside undergraduates. Private companies operate programs on various boarding school and college campuses, but instructors usually are not affiliated with the school. Summer program application deadlines range from the fall of the previous year for the most selective programs, to rolling admission or open enrollment programs that accept students until all spots are filled. Applying to selective summer programs offers a small-scale preview of the college application process, as students are evaluated on high school transcripts, standardized test scores, teacher recommendations, and essays or writing samples. Prerequisites for admission may include minimum GPA or PSAT/SAT scores, and some programs conduct phone or in-person interviews with applicants. Approach teachers for recommendations at least a month before the deadline, and give yourself time to fine-tune essays and ensure materials are complete. And don't put all your eggs in one basket-apply to several programs of varying selectivity so a rejection letter from your first choice won't leave you sitting at home all summer.